Could that $1.2 million Whampoa HDB Terrace used more as Home Office? On 21 November, Channel News Asia reported a record sale for a HDB Terrace. The terrace home in Jalan Bahagia, categorized as a 3 Rm HDB Terrace, was sold for S$1.185 mil. The home is 237 square meter and its land lease has only 52 years left. 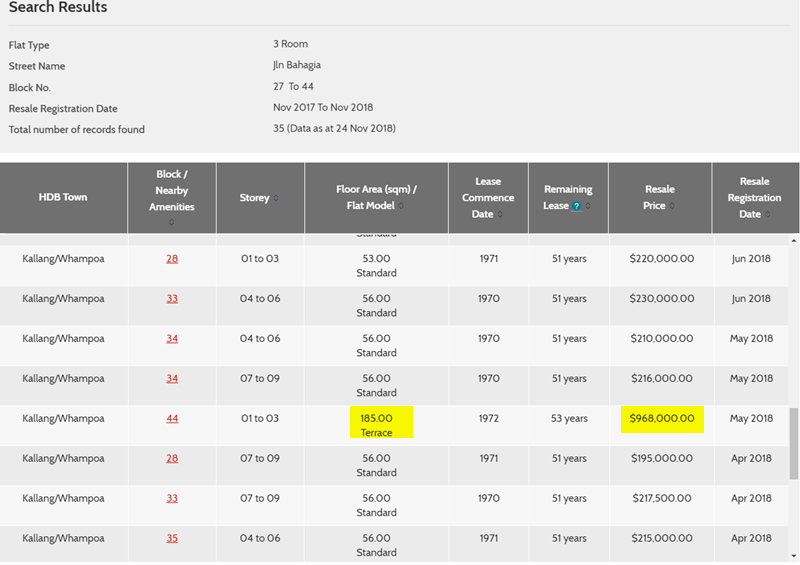 Much of the discussion about this transaction is how stupid are Singaporeans to pay so much for this terrace home. When I first heard about this, I thought it is still workable. It does not sound like this terrace was purchased by a buyer who do not know what he or she is doing. However, when I examine the numbers, I started to think may be there isn’t an investment rental case for this. I think it is damn challenging to purchase this terrace due to its short land lease. 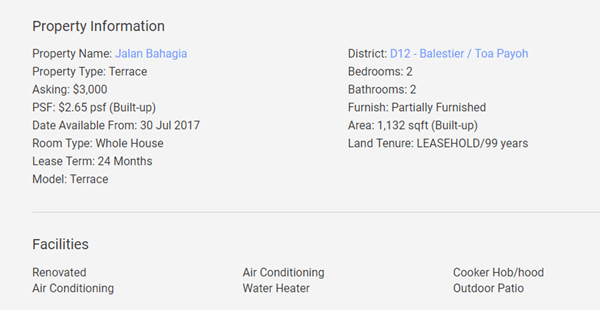 If your flat has a remaining lease of less than 60 years, there is a limit to how much you can use your CPF OA to finance this home. 1. No CPF can be used if the remaining lease is less than 30 years. This purchase does not violate this rule. 2. A flat owner is eligible to use his CPF savings for the flat only if his age plus the remaining lease of the flat is at least 80 years. Ok so suppose the person is 35 years old, so 35 + 52 = 87 <= Eligible. If you are 28 or below, you cannot use your CPF savings for the flat. 3. The maximum amount of CPF savings that can be used is a percentage of the lower of the purchase price or the value of the flat at the time of purchase. The percentage is computed based on the remaining lease of the flat when the youngest eligible member using CPF reaches age 55. So if I am 35 years old, I have 20 years till I am 55 years old. The remaining lease then would be 52 -20 = 32 years. So the maximum CPF savings that I can use is 32/52 x 1.18 mil = 726k. So you will need 1180 – 726 = $454,000 in cash to finance this. To compound the matter, you might find it challenging to secure a bank loan for a property with less than 60 year land lease. Given the price, it is likely to be purchase by someone with deeper pockets. My original thoughts is that there should be a value point somewhere. This value point is such that your purchase price earns a respectable internal rate of return, after factoring the maintenance and operating expenses. 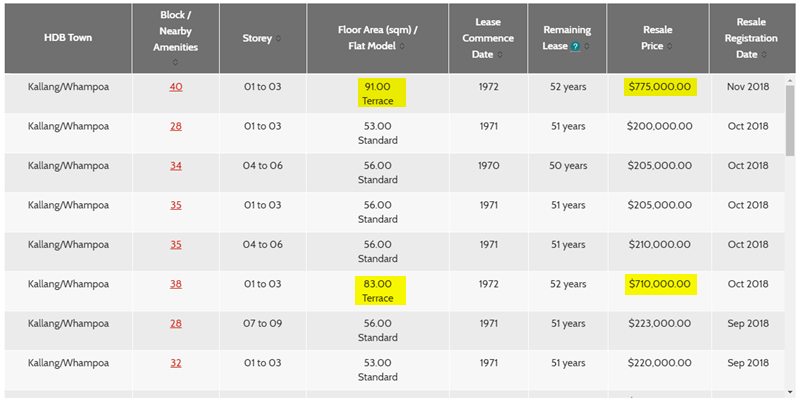 When I check the HDB transactions, the typical rental per month for that area ranges from $1,200/mth to $1,800/mth. Those are typically 3 Room HDB rental rates. So from a rental perspective it does not make much sense. My suspect is that all these were 3 room HDB rental and not terrace rentals. If we look at the recent resale transactions for the year, we can find a similar deal in May 2018 going for $968,000. Thus, it is not just one stupid person but that these folks sees some value in these terrace HDB. Some of the latest transactions were cheaper at $700,000++ but their size are also halved the previous one. I thought I missed it but behold, the 1.18 mil terrace. If we compare the size, this one is truly unique. Its much bigger than the rest, and perhaps why its price is higher than the 185 square meter one. This rent looks doubled, and if I were to compute the internal rate of return, the XIRR is 2.50%. If I look upon this terrace as a bond that I could not get back the principal, getting a 2.50% does not seem like a great reward. Not to mention that I will have to manage tenants. I was not familiar with the area so I didn’t notice it. But as I searched to find where is this HDB Terrace, I saw a familiar office pop up on the map. Turns out that our friends at The New Savvy is pretty close by. It then occurred to me that perhaps what appealed to the buyer is to make use of the HDB Terrace as his or her work and live premises. The new owner had the choice to rent or buy. If the owner chose to rent, she could not retrofit the place to a configuration conducive for work and live. Thus, by buying the premises, she could pay the 52 year rent upfront. If she doesn’t get the place, an investment in nearby offices might cost more than this. And she would have to get another home to stay at. The total cost of long term office rental plus home for living, might be more than this. With this, she could optimize the space, her needs for living and work. So this might make sense. If this place is permissible to be used as a home office, then those folks saying its stupid might not have ponder deep enough. 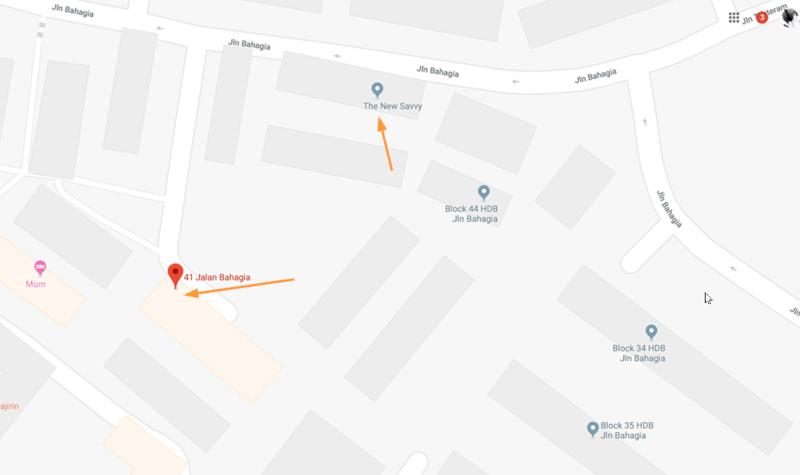 What is the XIRR for the Non Terrace Jalan Bahagia Flat? While we are at this, why not see what is the XIRR if I were to purchase these flats, with 50 year lease left, and rent them out after a 5 year MOP? The average resale value for the 3 room looks to be $210,000. 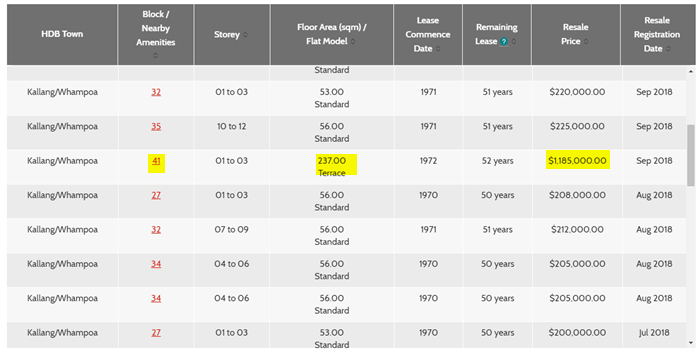 Since I am 38 years old, by 55 years old, I would have used up 17 years of lease. The lease left would be 50-17 = 33 years. So I can only use 33/50 x 210000 = $138,600 from my CPF. I would have to come up with the remaining $71,400 in cash. Looks like a decent XIRR but I wonder is it better to buy this or just put in a portfolio of dividend stocks. You let me know about your choice if you were in my shoes. Public transport is not so convenient at that location.